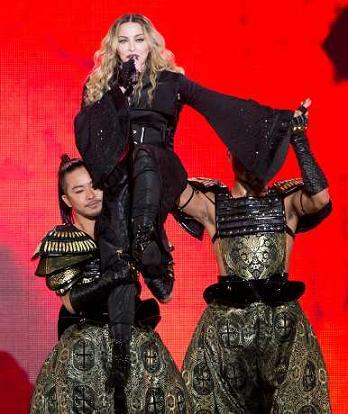 Ever the provocateur, singer, songwriter and producer, Madonna, brought out her Rebel Heart tour act at the Bell Centre in Montreal, Canada on Wednesday. Fashion designers Alessandro Michele for Gucci, Alexander Wang, Fausto Puglisi, Jeremy Scott for Moschino, Nicolas Jebran, Miu Miu, Prada and Swarovski are among her costume designers. In the US the Rebel Heart album made it to the top of the Billboard sales chart and the first two singles, "Living for Love" and "Ghosttown" went to No 1 on the Billboard dance charts. Rescuers search for a missing resident in Kanuma, Tochigi prefecture, north of Tokyo today following landslides. Tochigi authorities ordered more than 90,000 residents to evacuate, while another 116,000 were advised to leave their homes, public broadcaster NHK said. In Ibaraki prefecture, at least 20,000 were ordered to evacuate for fears of flooding, NHK said. 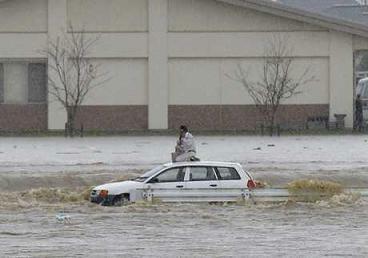 A frightened driver in Joso, Ibaraki prefecture, northeast of Tokyo today. Typhoon Etau pounded Japan yesterday and moved out into the Sea of Japan (East Sea) by the end of the day, but a wall of rain continued to lash the country. Parts of central Tochigi have seen almost 60 centimeters of rain since Monday evening, AFP reports. Evacuations have begun in Oyama in Tochigi prefecture, north of Tokyo today. 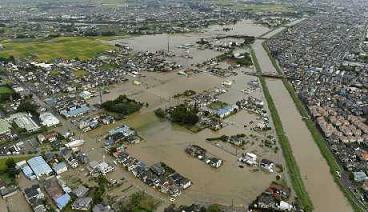 Authorities in central Japan ordered tens of thousands to evacuate after torrential rains flooded rivers and triggered landslides. People await rescuers in Joso, Ibaraki prefecture, (Pictured) northeast of Tokyo today following heavy rains. The Japan Meteorological Agency issued special warnings for Tochigi and Ibaraki prefectures, urging vigilance against mudslides and flooding. Tens of thousands of people were ordered to evacuate across Japan today as heavy rain pounded the country, sending radiation-tainted waters into the ocean at the crippled Fukushima nuclear plant. 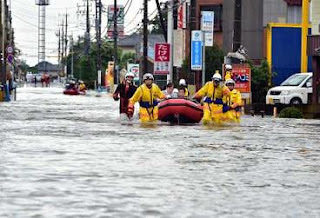 Waist-high floods in some areas left rescuers scrambling to pluck people to safety as a wide area was deluged in the wake of Typhoon Etau. “This is a scale of downpour that we have not experienced before. Grave danger could be imminent,'' forecaster Takuya Deshimaru told an emergency press conference. The Japan Meteorological Agency issued special warnings for Tochigi and Ibaraki prefectures, north of Tokyo, urging vigilance against mudslides and flooding. More than a dozen people were injured, including a 77-year-old woman who broke her leg after falling in strong winds, local reports said. Etau, which smashed into Japan yesterday, moved out into the Sea of Japan (East Sea) by the end of the day, but a wall of rain continued to lash the country. Parts of central Tochigi have seen almost 60 centimeters of rain since Monday evening. The torrential downpour has also exacerbated a contaminated water problem at the Fukushima nuclear plant as it overwhelmed the site's drainage pumps, a spokesman for operator Tokyo Electric Power said. Hundreds of tons of contaminated water have flowed into the ocean, he added. TEPCO is storing huge volumes of water used to cool reactors that were sent into meltdown when a tsunami hit Japan in 2011. 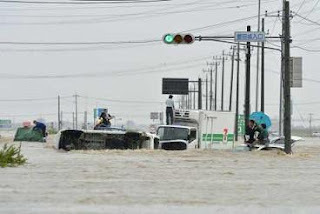 In Ibaraki prefecture, at least 20,000 were ordered to evacuate for fears of floodings, NHK said. Prime Minister Shinzo Abe said the government was on high alert. “The government will stand united and do its best to deal with the disaster... by putting its highest priority on people's lives,'' Abe told reporters. The meteorological observatory in Tochigi said the Kinugawa river, which also runs through Ibaraki, overflowed early today. 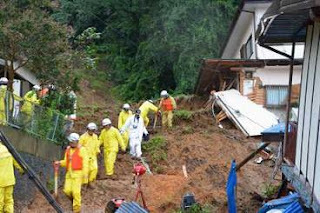 In Tochigi's Kanuma city, a local official said rescuers were searching for a missing person believed to be buried in mudslides. “We don't know details of this person yet,'' he said. In just 30 seconds, 10,000 tickets to see Pope Francis preside over a mass in Philadelphia in the US later this month were gone, the Archdiocese of Philadelphia said Wednesday. The pontiff is visiting the US from September 22-27. The day before, it took all of two minutes for the 10,000 tickets to see Pope Francis' outdoor speech at Philadelphia's Independence Mall to be snatched up. The mass will be the day after that event and will take place outdoors on Benjamin Franklin Parkway, outside the Philadelphia Museum of Art, as part of the World Meeting of Families conference. Tickets to both events were free and available online. The pope will arrive in Washington on September 22, meeting with President Barack Obama and addressing a joint session of Congress over the next several days. He will then move on to New York where he will address the UN General Assembly and say mass in Madison Square Garden. Malaysian authorities are searching for a cargo ship that has been missing for a week and is feared to have been hijacked, a coast guard official said. The owners of the Malaysian-registered vessel lost contact with it last Thursday while sailing along the coast of the Malaysian state of Sarawak. The MV Sah Lian was carrying a mixed cargo including iron products, piping and food from the Sarawak capital Kuching to the town of Limbang, manned by a crew of 14 including Malaysian, Indonesian, Myanmar, and Indian nationals. 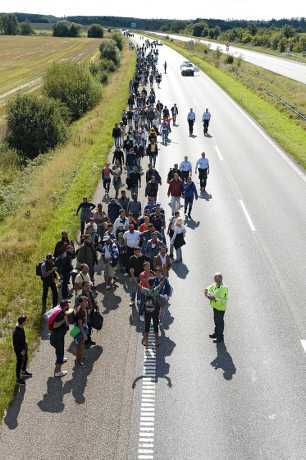 Danish police today closed part of a motorway near the German border as about 300 migrants set off on foot to Sweden, which has more generous asylum rules than Denmark. The distance on foot is 300 kilometers to Copenhagen, then a train ride from the Danish capital to the southern Swedish city of Malmo. The school “is not a prison and there is no fence around it. When 300 people at once decide to leave the school we take a dialogue-based approach,'' local police said in a statement. “Police have chosen not to intervene with force'' but was “following the group,'' it said. Many women, children and elderly were among those marching and a smaller group of elderly people had been asked to be driven back to the school. The United Arab Emirates has defended its response to the Syrian refugee crisis in the face of criticism that oil-rich Gulf states should be doing more to help thousands who are fleeing. In a statement provided to The Associated Press, the Emirati government said it has provided residency permits to more than 100,000 Syrians who have entered the country since 2011, and that more than 242,000 Syrian nationals currently live in the country. It did not provide details on the terms. Residency visas in the Emirates _ where foreigners outnumber citizens more than four to one _ are typically tied to an employing sponsor or a resident family member, and do not allow for an indefinite stay in the country or an opportunity to acquire Emirati citizenship. In addition to the visa extensions, the Emirates said it has provided more than US$530 million in humanitarian aid and development assistance since 2012 in response to the Syrian crisis. Part of that aid goes to fund a camp in Jordan that houses more than 4,000 refugees.